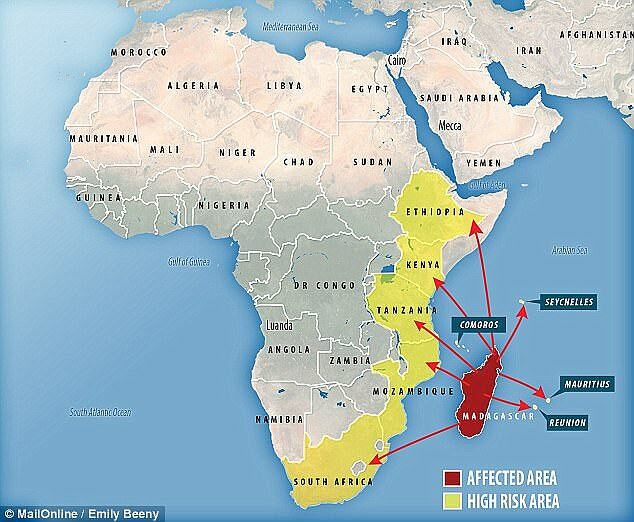 I keep thinking that a new and novel lab produced hybrid will be introduced to Africa in the near future ,,, this will be called a "mutation"
It is truly hoped our Country has it set up to not do trade with Madagascar and the rest of countries in yellow. All travel should stop. Any lines connecting us with Madagascar & the yellow needs to be interrupted -- regardless of commerce. Food & medicine they need can be dropped by parachute. You would think in this modern day & age, the disease could be contained from the rest of Humanity. DOCTORS are struggling to keep a new lethal outbreak of the "Black Death" â€“ also known as pneumonic plague â€“ under control as numbers of recorded cases soar. Earlier this week, infection and immunity expert Dr Matthew Avison told Daily Star Online that the â€œextremely rareâ€� disease has been â€œresilientâ€� to antibiotics. A spokesman for the World Health Organisation admitted there were fears that this strain of plague â€“ which is now believed to be airborne â€“ could cause a global outbreak of the disease. What do we do to not get this Black Death plague? Are you a ancestor of black plague survivors ? ie european plague survivor ? LIVERPOOL, UK - 9 March 2005: Biologists at the University of Liverpool have discovered how the plagues of the Middle Ages have made around 10% of Europeans resistant to HIV. Scientists have known for some time that these individuals carry a genetic mutation (known as CCR5-Ã„32) that prevents the virus from entering the cells of the immune system but have been unable to account for the high levels of the gene in Scandinavia and relatively low levels in areas bordering the Mediterranean. Professor Christopher Duncan and Dr Susan Scott from the University's School of Biological Sciences, whose research is published in the March edition of Journal of Medical Genetics, attribute the frequency of the CCR5-Ã„32 mutation to its protection from another deadly viral disease, acting over a sustained period in bygone historic times. Some scientists have suggested this disease could have been smallpox or even bubonic plague but bubonic plague is a bacterial disease rather than a virus and is not blocked by the CCR5-Ã„32 mutation. Professor Duncan commented: "The fact that the CCR5-Ã„32 mutation is restricted to Europe suggests that the plagues of the Middle Ages played a big part in raising the frequency of the mutation. These plagues were also confined to Europe, persisted for more than 300 years and had a 100% case mortality." Professor Duncan and Dr Scott illustrated in their book, Return of the Black Death (2004, Wiley), that this idea was incorrect and the plagues of Europe (1347-1660) were in fact a continuing series of epidemics of a lethal, viral, haemorrhagic fever that used the CCR5 as an entry port into the immune system. Professor Duncan added: "Haemorrhagic plague did not disappear after the Great Plague of London in 1665-66 but continued in Sweden, Copenhagen, Russia, Poland and Hungary until 1800. This maintenance of haemorrhagic plague provided continuing selection pressure on the CCR5-Ã„32 mutation and explains why it occurs today at its highest frequency in Scandinavia and Russia." London (CNN)It might sound like a really old wives' tale, but a thousand-year-old Anglo-Saxon potion for eye infections may hold the key to wiping out the modern-day superbug MRSA, according to new research. The 10th-century "eyesalve" remedy was discovered at the British Library in a leather-bound volume of Bald's Leechbook, widely considered to be one of the earliest known medical textbooks. Lee enlisted the help of the university's microbiologists to see if the remedy actually worked. The recipe calls for two species of Allium (garlic and onion or leek), wine and oxgall (bile from a cow's stomach) to be brewed in a brass vessel. The researchers then tested their recipe on cultures of MRSA, methicillin-resistant Staphylococcus aureus, a type of staph bacterium that does not respond to commonly used antibiotic treatments. The scientists weren't holding out much hope that it would work -- but they were astonished by the lab results. "What we found was very interesting -- we found that Bald's eyesalve is incredibly potent as an anti-Staphylococcal antibiotic in this context," Harrison said. In the centuries before the Black Death, about 10 percent of people lived past age 70, said study researcher Sharon DeWitte, a biological anthropologist at the University of South Carolina. In the centuries after, more than 20 percent of people lived past that age. Netea and Bertranpetit propose that the Rroma and European Romanians came to have the same versions of these immune system genes because of the evolutionary pressure exerted by Y. pestis. Other Europeans, whose ancestors also faced and survived the Black Death, carried similar changes in the toll-like receptor genes. But people from China and Africaâ€”two other places the Black Death did not reachâ€”did not have these changes. (There have been multiple plagues throughout history around the world, but none have been so deadly as the Black Death, which killed an estimated one in every four Europeans, and so exerted very strong selection.) The similarities in the other genes were likely caused by other conditions experienced by Rroma and Europeans, but not Indians. Health officials warn that an outbreak of flea-borne typhus is now taking place in downtown Los Angeles. CBSLA reports that the Los Angles County Department of Public Health is investigating ?several cases? of the typhus strain and warns that it is a ?disease that infected fleas can spread to humans.? Fleas carrying the disease are found on rats, areas where there is an accumulation of trash, and cats, but pets do not get sick from typhus. Fleas with typhus are a danger in ?areas where there is an accumulation of trash,? as such an accumulation attracts wild cats, opossums, and other animals. At this time, the county health department recommends pet owners ?Use flea control products on pets.? They also recommend that people ?wear pants tucked into socks or boots when outside? and ?spray insect repellent with DEET on socks and pant cuffs.? In a nearly 5,000-year-old tomb in Sweden, researchers have discovered the oldest-known strain of the notorious bacterium Yersinia pestis ? the microbe responsible for humanity's perhaps most-feared contagion: the plague. The finding came about as the researchers were analyzing publicly available databases of ancient DNA for cases in which infections might have claimed prehistoric victims. They focused on the previously excavated site of Fr?lseg?rden in Sweden. Previous analysis of a limestone tomb at the site found that an estimated 78 people were buried there, and they all had died within a 200-year period. The fact that many people died in a relatively short time in one place suggested they might have perished together in an epidemic, lead study author Nicol?s Rascovan, a biologist at Aix-Marseille University in Marseille, France, told Live Science. The limestone tomb was dated to the Neolithic, or New Stone Age, the period when farming began.